Most people either love reality TV or hate it. Either way you are going to want to keep reading about the latest addition to the reality mix that premiered last Sunday Neale Bayly Rides (NBR). It is a 3 part series that documents a group of friends traveling on a motorcycle adventure that ultimately changes their life perspectives. If you missed the premier this past Sunday, no worries; these days between re-runs and on-demand you can quickly get caught up and ready to tune in to Part 2 airing this Sunday at 9pm (EST) on Speed channel. Whether you are a motorcyclist or not, this show will impact you in a humbling and positive way. Neale Bayly is a motorcycle journalist that has traveled 45 countries over the past 35 years. A few years ago his travels landed him at an orphanage in Peru. Inspired by the children, Bayly formed Wellspring International Outreach, an organization dedicated to raising awareness, resources, and hope for abandoned children worldwide. Neale’s journey changed his life to the point he was inspired to invite friends to ride with him, as a film crew documented the epic journey. 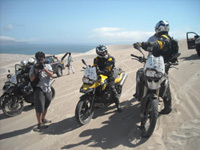 Neale leads his 5 friends through the deserts and mountains of Peru. Beginning in Lima, the group encounters unbelievable challenges and create unforgettable memories along they way as they pass through the Ica Desert, Andes Mountains, and eventually arrive at the Hogar Belen Orphanage in Moquegua, Peru. Tune in this Sunday at 9pm on the Speed Channel for Part 2 of Neale Bayly Rides, reality TV with heart! Get a taste of what drives motorcyclists to pack their bikes and depart for epic adventures of sight-seeing, meeting new faces, and making life long memories along the way.